In my last post I shared about my plans to stay home this school year with my daughter as she starts half day preschool and we prepare to welcome baby #2 in December. Although I don't have a classroom of my own this year, that has not kept me out of the classroom. I have been able to help several of my local music teacher friends get their rooms ready for the first day of school. I wish I could just take a little road trip all summer long decorating music rooms, because I enjoy it so much! 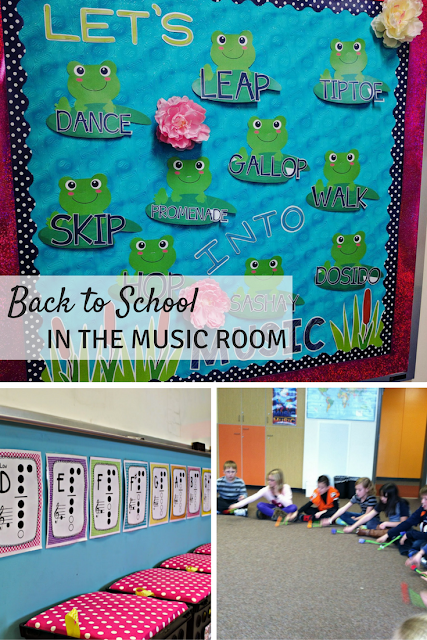 Today I am teaming up with 5 other fabulous music bloggers to share ideas for "Back to School in the Music Room". From decor, to organization, to what activities to try that first day/week/month, we've got you covered! My post is going to tackle Music Room Decor. After you read my post, you can click the picture at the bottom to hop to the next blog post. Keep going until you are all the way back to mine to make sure you have read them all! So let's talk music room decor. We need to be intentional with what we put on our walls, and not just print and post everything under the sun or hang every poster we own. I've also seen a lot of posts in Music Teacher Facebook groups recently about people who feel it is easy to over-do it when it comes to music room decor by filling every bit of wall space they have and how it is overstimulating kids. You've probably thought long and hard about what would be appropriate rules for your music room. If you expect your students to follow those rules, you need to have them posted in your room, and you need to spend time those first few lessons going over them and then every subsequent lesson enforcing them. I always post mine right in the front of the room. I put little magnets on the back so they could hang on my board and be "front and center" for kids to see, right beside whatever I would be projecting on my board that day. I have lots of different themes, but this set is my personal favorite and it comes from my watercolor classroom decor. Find it here. Other themes available include superhero, rock star, polka dot, nautical, frogs, space, multicultural kids with instruments, birds and owls. I almost always have one board in my classroom that is dedicated to lines and spaces of treble clef. This comes in handy when we get to lines/spaces, note names, and playing on pitched instruments. I invaded my friend's classroom this week (thanks, Lynn!) and decorated a board for her while we chatted and she looked at her schedule and got things ready for open house. I had this idea for a hot air balloon bulletin board for a while, but was just waiting on the right clip art. I wanted some dreamy looking watercolor hot air balloons, so I had a set custom created for me. 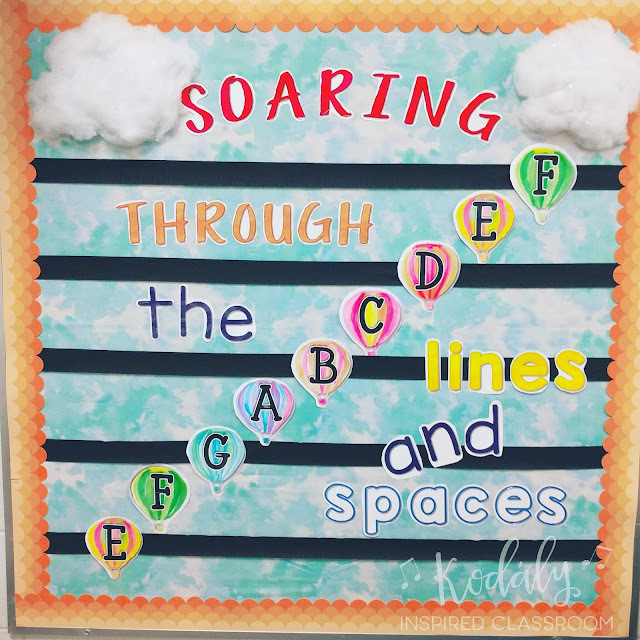 You can find my "Soaring Through the Lines and Spaces" bulletin board set here. Another board that I did this August (thanks, Mia, for letting me take over this board) reinforces movement vocabulary. 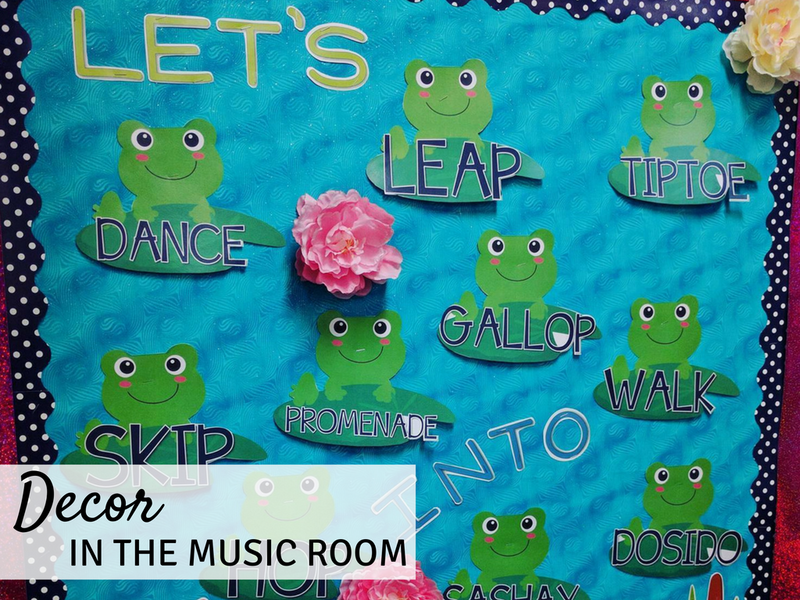 I love that it brings a lot of the same movement words from PE (plus some new ones that maybe are more specific to music and folk dancing) into the music room. 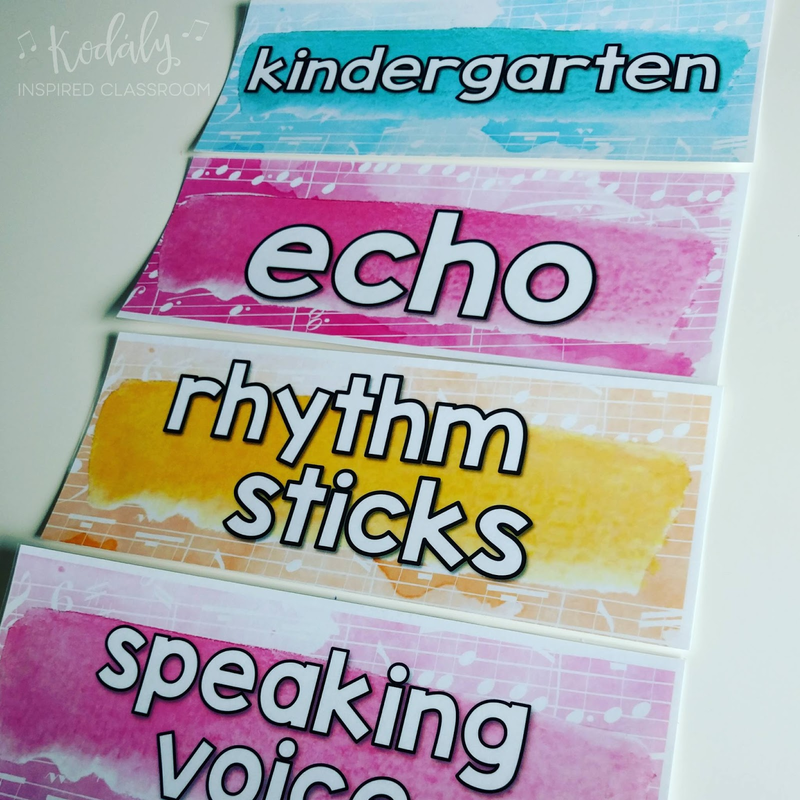 Sometimes we forget about movement vocabulary, but I think it is important to clarify movement vocabulary in the same way that we define music terminology, especially if we are wanting students to respond to music in a certain way though movement or perform some movement to music. After I went through Kodaly levels, I was a little uncertain about whether or not I wanted solfege hand sign posters displayed on the wall in my room, because I hadn't presented them all yet, and I didn't want it to take away the surprise. 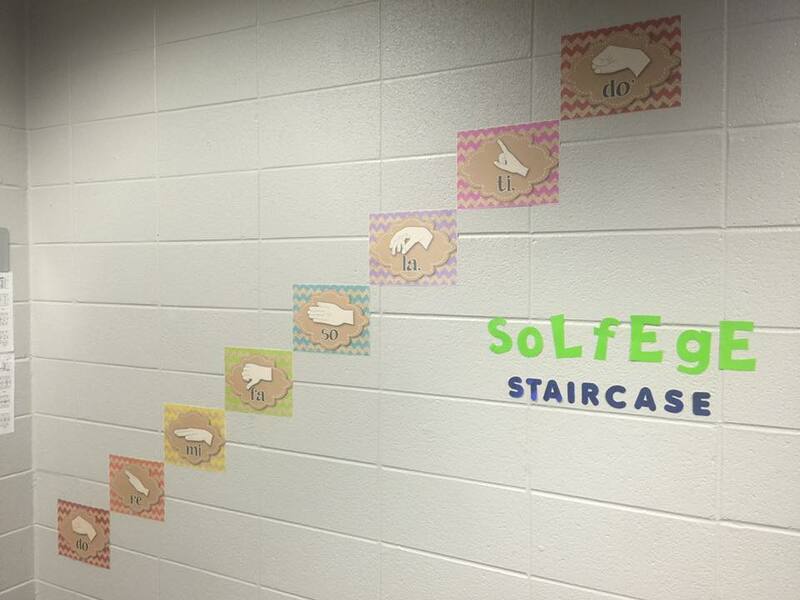 I decided two years ago to go ahead and have them posted year round, and was amazed how frequently my students referred to them, taking a sideways glance while we were solfege-ing (yep... I just made that a verb) folk songs in class. Even when we had been in the practice stage of a melodic concept for a while, I would still see students utilizing this. Would they know the name of the new mystery solfege? Yes, generally, BUT it doesn't take away from the Prepare/Present/Practice because even if they know the name, they still need to know how it sounds. I have had a lot of questions about how I set up my word wall, and I will definitely be devoting a whole blog post to it at some point in the near future, but for now here are some ideas. I always post my word wall cards by grade level in the order that they are presented (more on that in a future post). These are from my watercolor music room set. Find the word wall individually here. In the picture below, the music teacher chose to focus on words specifically centered around singing. This is a great idea for an elementary or middle school choir. The concepts become less abstract if they can be seen by the students and referred to them. They can really try to focus on one of these concepts when they rehearse a piece instead of "mindlessly" doing it again. 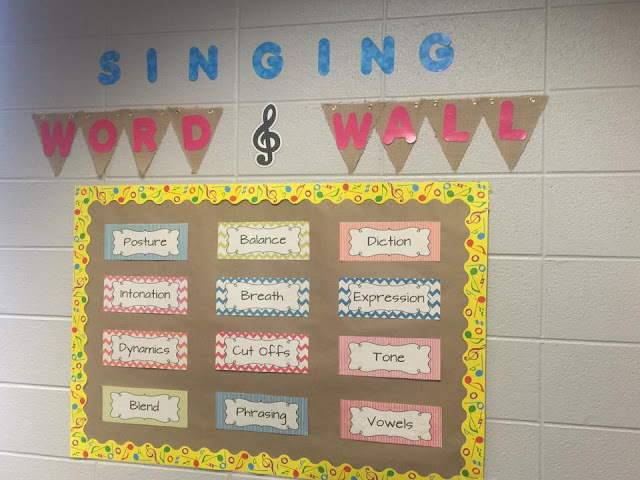 Find this choral singing word wall here. 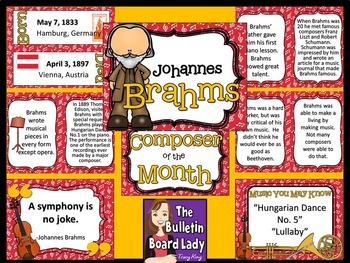 Some teachers do a composer of the month. Do me a solid favor and DON'T arbitrarily post composers on your wall and never talk about them. 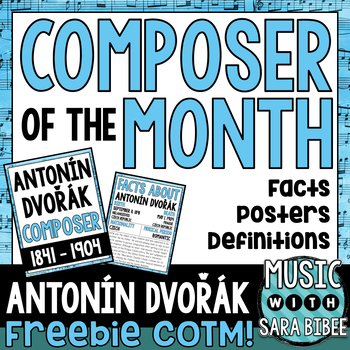 One way to do this is to have a "Composer of the Month" board. 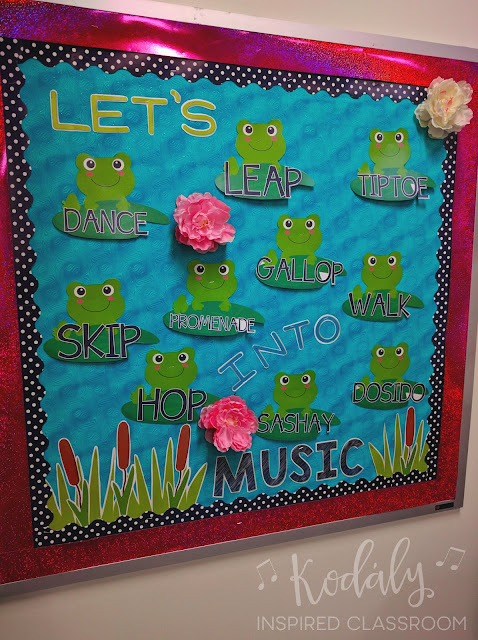 If you do this, you MUST talk about that composer and use their music in your lesson plans - move it it, create a listening map, add a rhythm ostinato, read known rhythmic or melodic patterns from the music, etc., otherwise it is a waste of a board/wall space. If you do decide that a COTM set is worthy of your wall space and teaching time, you need to check out these free sets from Tracy King and Sara Bibee. Both of these ladies produce wonderful sets! I hope you have enjoyed this post on my "must have" music room decor. Comment below if there is anything else that is a "must have" on your boards/walls. I'd love to hear about it! Don't forget to continue on the blog hop. 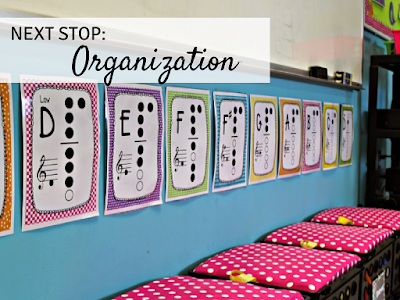 Hop to the next stop, Jena Hudson from Sew Much Music's post Organization. These are great thoughts! I was really trying to be purposeful this year, in only hanging things on the walls or bulletin boards that I'd use, so I loved your suggestions (and bulletin boards!) Thank you! Thanks! I had so much vertical wall space in my last classroom it would almost be impossible to overdo it with because the ceilings were so high, but it is definitely worth considering how much we put on our walls, what we put on our walls and why. I would never go to the other side of the pendulum and have NOTHING on my walls. That, I feel, is a missed opportunity for student learning. Great post! I agree, you have to put things on your walls that are useful! 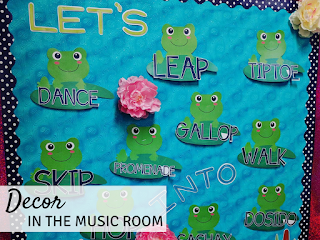 I love the movement vocabulary bulletin board!